Gigabit LTE is boosting capacity to meet demand today and setting the stage for a smooth roll out of 5G that will enable users to have a consistent network experience as they move from 5G hot spots onto gigabit LTE. But there’s a big difference between 500 Mbps or 1 Gbps and 10 Gbps delivered with latency less than 1 millisecond. And a big part of that difference is millimeter wave spectrum. Currently operators are primarily focused on tapping millimeter wave spectrum to deliver fixed wireless services like enhanced broadband for businesses and multiple dwelling units like apartment complexes. The major driver here is economic– namely how a service provider can provide a fiber-like experience without the time and expense of laying fiber-to-the-home or fiber-to-the-premise. Referencing the above , Gresham explained: “The horizontal axis represents the frequency spectrum from approximately 1 to 90 GHz on a relative scale. The orange…bars on the middle and right of the top figure show the approximately 11 gigahertz of new spectrum released by the FCC for both licensed and unlicensed use. Although the precise frequency allocations vary across the globe, there’s similar initiatives in Europe and Asia as well. The picket fence of blue lines on the left shows the fragmented…spectrum that’s available below 6 GHz. The available scale of the relative spectrum is quite easy to see.” The red and green blocks show frequency allocations for the aerospace and defense and satellite communications industries; Anokiwave was worked in A&D and satcom for more than a decade, Gresham said, which has resulted in millions of dollars in investments that have driven down the cost of attendant electronics and deployments. “Why are millimeter wave active antennas critical for 5G?” Gresham asked. 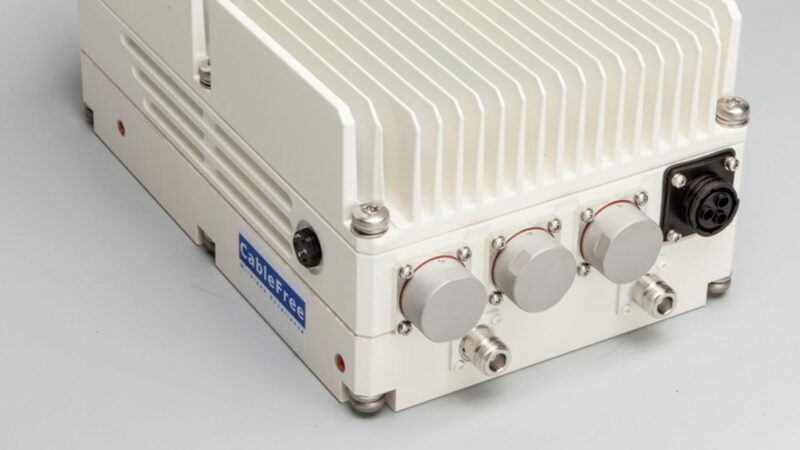 “The most important consideration is the high path loss at millimeter wave, which is somewhere around 62 dB per meter at 28 GHz for line-of-sight propagation. That means the development of a robust link seems extremely challenging. The reciprocal benefit is the short wavelength, which is about 5.6 millimeters at 28 GHz, means you can develop a large effective aperture in a very small area. That means you can generate extremely high radiated power through construction in the far field. Conversely at the receiver the radio sensitivity can also be scaled by increasing aperture size. Because the antennas are active, you can change the direction of the beam very dynamically to serve multiple users, you can provide spatial orthogonality through adaptive beam forming or shaping and you can rapidly change point and direction to adapt to changing propagation channels in dynamic environments. You can also form sub arrays of radiating elements which can be used to provide the MIMO functionality…which is also applicable for increasing data throughput and providing some link robustness.” But there are problems to be solved, Gresham said, “especially around the issues of user mobility. How do you implement this functionality in the user equipment (UE)?” More innovation will be needed for future mobile terminals.